Most common carp captured in the Great Lakes are caught from Lake Erie, with 5% of US landings also from Lake Huron. Seine nets represent about 56% of landings, with traps representing 44%. Harvest over the last decade averaged 500,000 lbs, at an average value of $122,000. Most are sold live, with others processed for their roe. It is unclear how much is exported outside of the country. 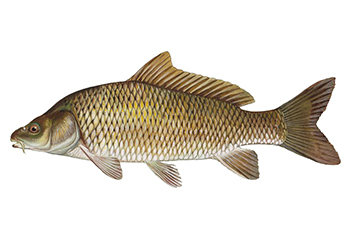 Common carp caught in the US Great Lakes by trap nets and seine nets are Recommended due to healthy abundance and minimal impacts on the habitat. As an introduced, non-native species, there are no concerns over abundance or mortality rate. Physical impacts on the lake floor are low, with trap nets and seines set on muddy or sandy bottoms with quick recovery times. Ecosystem impacts are a low concern as forage stocks are considered healthy and it is unlikely that fishing pressure will have adverse food web effects. Some species are caught as bycatch in the trap net fishery, including channel catfish, freshwater drum and white bass, all of which have minimal information on abundance and fishing mortality. The seine net fishery also capture gizzard shad, which has a high concern for fishing mortality rate, due to it’s importance as a forage fish. Management is considered moderately effective, but stronger measures are needed to protect native species and control carp populations.